Ronny and Jo Ann Sivils received a rude but welcome wake-up call on Thanksgiving night at 1 a.m. by the bell and ratchet on Ronny's Fenwick ulua pole. The 13-foot rod was bent over as Ronny's Penn Senator reel released line to a rampaging monster of a fish. An hour-long battle, a broken gaff and a dangerous leap into the ocean followed, but Ronny and Jo Ann finally secured the fish. 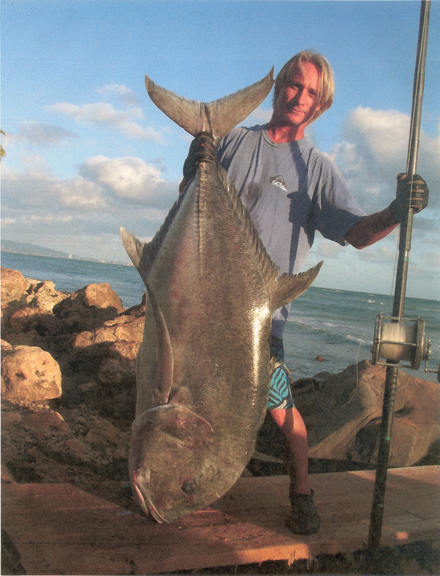 The ulua amazed everyone at Roy's Fishing Supply during the weigh-in because it pulled the scale down to a shocking 143 lbs 3 oz!